Protesters gathered outside the United States Army base in Fort Hamilton, Brooklyn on Wednesday to express their outrage over the targeting of 35-year-old Pablo Villavicencio, an undocumented immigrant from Ecuador who faces deportation after delivering a pizza to the base last Friday. Villavicencio was detained by military police upon delivering the pizza, a.k.a doing his job, then handed over to Immigration and Customs Enforcement agents. According to Villavicencio’s wife, Sandra Chica, he presented the military police with his New York City identification card, but they demanded to see a driver’s license, too, and he didn’t have one. 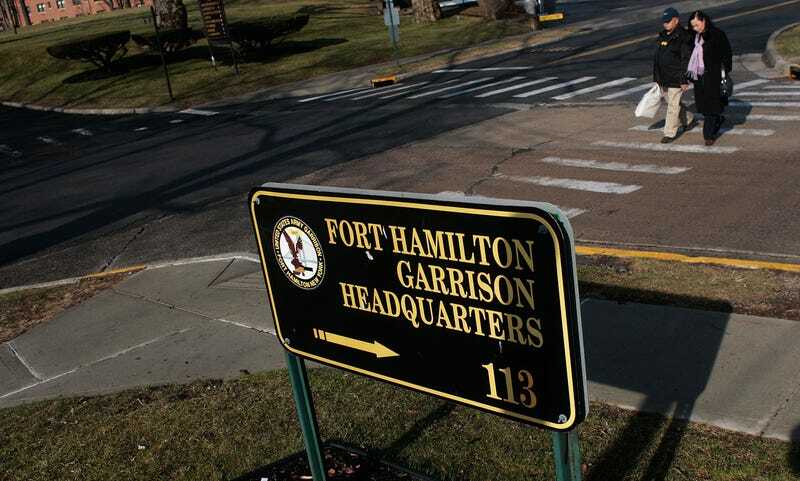 Incredibly, a spokesperson for the Army named Catherine SantoPietro said in response to Villavicencio’s detainment that visitors to the base must obtain a day pass, which requires an on-site background check. “Upon signing a waiver permitting a background check,” said SantoPietro, “Department of the Army Access Control standard for all visitors, an active Immigration and Customs Enforcement warrant was discovered on file.” Again, he was delivering a pizza, not paying a visit. A spokesperson for ICE told the New York Times that Villavicencio does not have a criminal record. In 2010, he was granted a voluntary departure order from an immigration judge, at which point he did not leave the country. Villavicencio migrated to the United States from Ecuador in 2008. “In one day your life changed,” Chica said. “Now I’m alone with two kids.” Speaking to PIX 11 News from an ICE detention center in New Jersey on Wednesday, Villavicencio said, “They treated me like a criminal. I did not commit a crime. My daughters need me. My wife needs me.” His family told PIX 11 that Villavicencio might be deported as early as next week.